For me, one of the gems of PAX East 2013 was a game located in a tiny booth on the edge of the expo floor. Entitled Eon Altar, developer Flying Helmet Games ambitiously combines a tabletop RPG with a video game for a unique cooperative experience. I’ve recently really gotten into tabletop games, but though I love playing them, set-up and clean-up can be a time-consuming and boring chore. 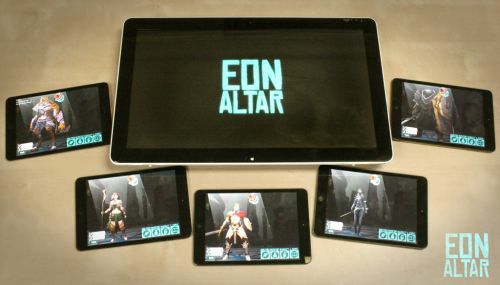 Eon Altar could not make this process any simpler, with the virtual tabletop being a central tablet that all players will interact with throughout the adventure. Each player also gets their own personal tablet or smartphone which supports a myriad of functions: display their character sheet, prompt them to act during their turn, enable them to roll dice when needed, and show their own personal combat up close. 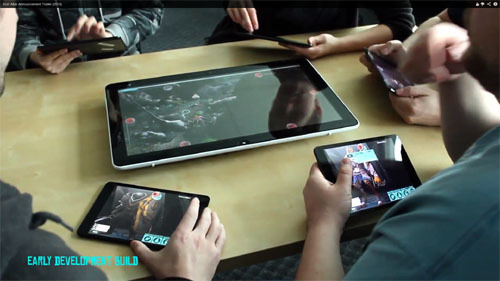 Since it’s a tabletop game at heart, all players will need to be in the same physical location, and their personal tablets/smartphones will sync with the central tablet over Wi-Fi. The demo I played at the booth supported up to 5 players in the adventure, and each player was assigned one of the 5 available characters (though Executive Producer Haydn Wazelle told me that they’re hoping to launch with 7 or 8 characters). Play is turn-based with a player prompting their character via the touchscreen on the central tablet to move across the dungeon floor to explore or engage in combat. When a character gets too close to an enemy, combat will start, and nearby characters will also be asked if they want to join in on the fight. From here the gameplay shifts to a player’s personal device. They will select an enemy to attack, and will have to roll dice to see if they hit or crit. Several dice are often rolled at a time (the number of dice rolled appears to be affected by a number of factors). If a 5 or 6 is rolled, their character hits, and if two 6s are rolled, they crit. Defense rolls are made in a similar fashion. It’s a little hard to explain in text, but check out the following video to get a better idea of the gameplay. The turn-based system and dice rolling are not the only elements that mark Eon Altar as a tabletop game, however. It’s also quite story-driven, and instead of voice acting, players will be prompted by their personal devices to read lines of dialogue during key events. Though the characters will be set individuals, players will be able to customize how they level up through ability point allocation to skills. Eon Altar is only 5 months into development, so the demo on the floor was a little rough around the edges (this was their very first public demo). There were some bugs, and the team told me that they really want to speed up the combat as they continue to develop the game. Despite these things, however, I was very impressed with what I saw. The character models were pretty impressive, the gameplay system was well thought-out, and the folks are Flying Helmet Games definitely know where they’re going with this one. Not only is the game built on a pen-and-paper game that a couple of the developers personally designed over ten years ago, but the developers themselves have some pretty impressive resumes. These are folks who have worked on some big names like Mass Effect 2, Rainbow Six 2, and Need for Speed. They’re not newcomers to the industry at all. Their current plan is for episodic content with at least 9 episodes planned and each episode providing about one hour of play. Though they’re still considering their marketing options, the most any group of friends would have to pay is for one copy of the game on the central device, with the personal device apps being provided for free. And did I mention that cross-platform play will be fully supported between iOS, Android, and Windows 8 devices? Pretty snazzy. Release is still at least about a year off, but I’m really looking forward to hearing more about Eon Altar. Page created in 0.7209 seconds.